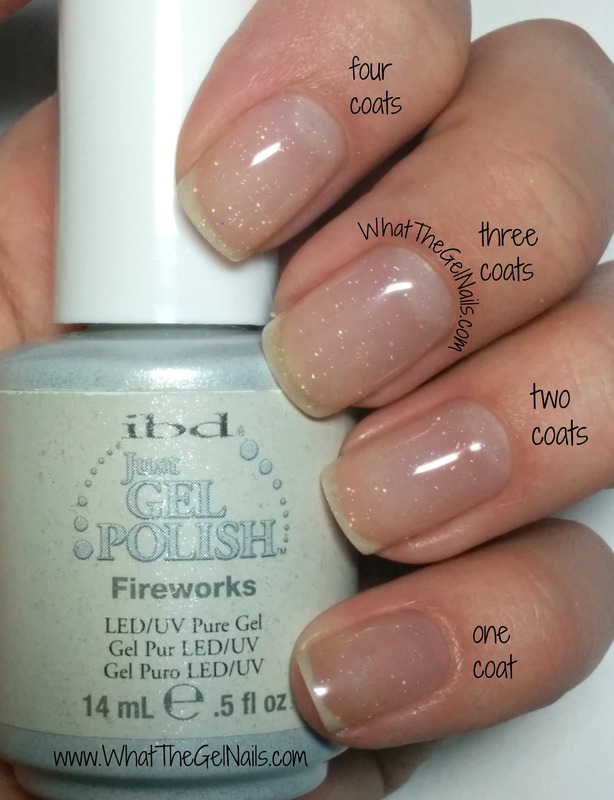 Since New Year’s Eve is coming up soon, I thought it would be the perfect time to show some swatches of IBD Just Gel polish glitters. I am obsessed with glitter. I always say, “Is this too much glitter… nah, you can never have too much glitter!” Haha! I especially love glitter polish because the glitter only sticks to your nails and nothing else. Now, this one is not quite a glitter, but it’s not quite a color polish either. It’s kind of a hybrid. It has a beautiful white sheer base with lots of glittery goodness inside. It’s kind of a shimmer, but also kind of a glitter. In the first two pictures I have 2 coats of IBD Whipped Cream, then 2 coats of IBD Ivory Tower on the pinky and ring finger. 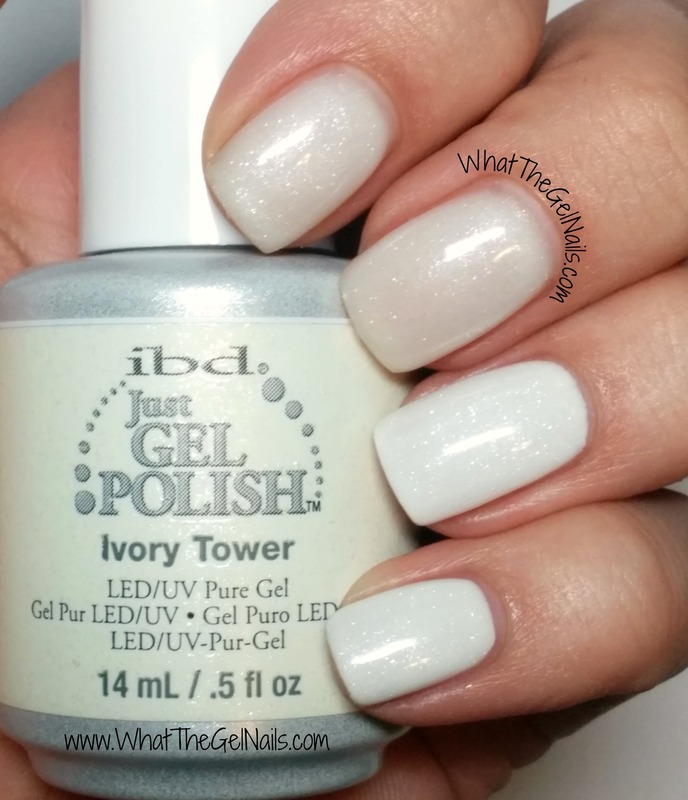 The other nails have 6 or 7 coats of Ivory Tower! Yes, 6 or 7!! I lost count around 4 coats so I can’t remember exactly how many coats, but the point is that IBD Ivory Tower doesn’t work that great on its own unless you want a sheer polish. In the third picture I have 1 coat of Ivory Tower over various colors. The pointer finger is 3 coats IBD Black Lava with 1 coat IBD Ivory Tower. 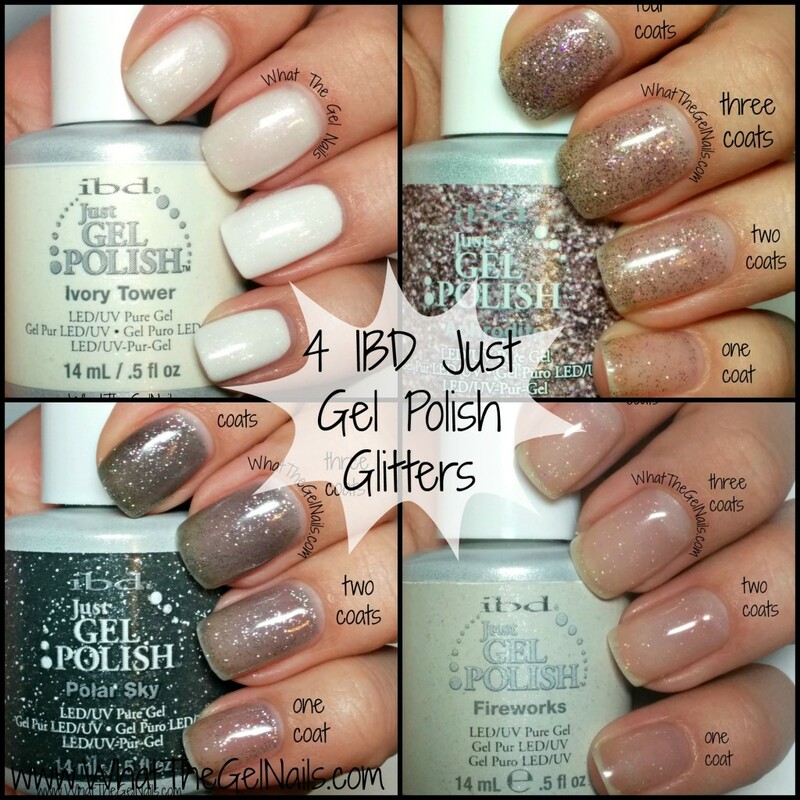 Middle Finger has 3 coats IBD Magic Genie and 1 coat IBD Ivory Tower. Ring finger has 3 coats IBD Green Monster and 1 coat IBD Ivory Tower. The pinky has 4 coats of IBD Ivory Tower. My favorite is Ivory Tower over Black Lava. I wish I had discovered that combination before Halloween! It’s beautiful. Find swatches of all colors in my Swatch Gallery. Aphrodite is an amazing purple glitter topper. It’s not very dense so it doesn’t work for full coverage, but it makes a great topper. I love that there is purple and holographic glitter. It makes for a beautiful effect. In the first picture, I have one coat on the pinky, 2 coats on the ring finger, 3 coats on the middle finger, and 4 coats on the pointer finger. This way you can see how multiple coats look. In the second picture I have IBD Aphrodite over different colors. Pointer has 3 coats IBD Black Lava and 1 coat IBD Aphrodite. Middle has 3 coats IBD Whipped Cream and 1 coat IBD Aphrodite. Ring has 3 coats IBD My Babe and 1 coat IBD Aphrodite. 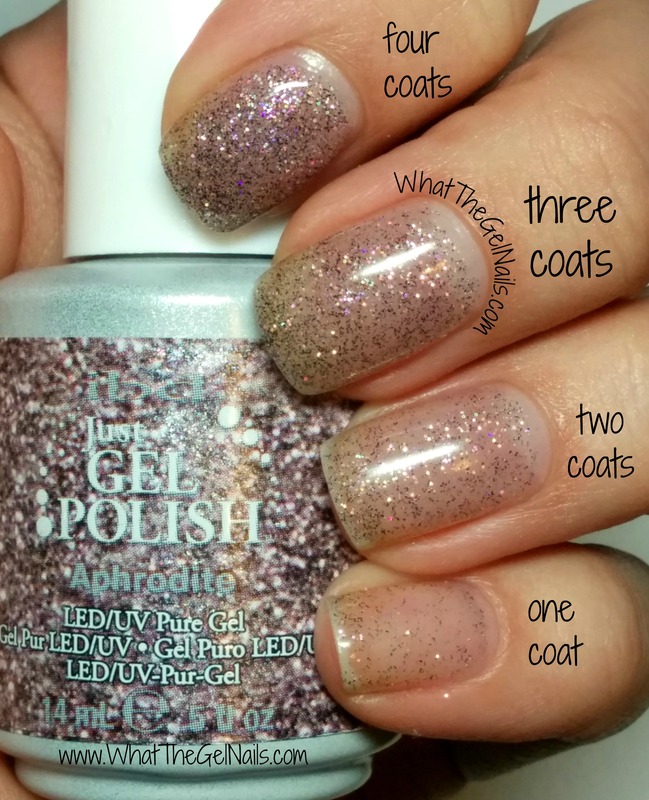 Pinky has 4 coats of IBD Aphrodite. All swatches are in my Swatch Gallery. 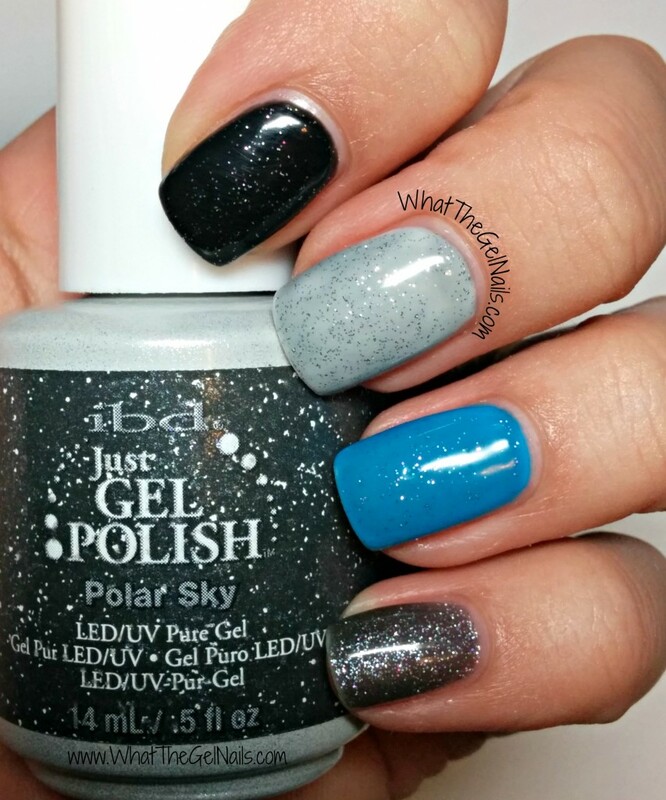 Polar Sky is a silver glitter topper with a sheer gray base. 4 coats of it is not quite fully opaque, but 5 coats of it is. If you wear it over a silver color (like IBD Amethyst Surprise) is gets opaque in 2-3 coats. The first picture has a different number of coats on each finger so you can see how multiple coats look. The second picture has IBD Polar Sky over other colors. Pointer-3 coats IBD Black Lava and 1 coat IBD Polar Sky. Middle-3 coats IBD Whipped Cream and 1 coat IBD Polar Sky (the sheer gray base really stands out on this nail). Ring- 3 coats IBD Swag Bag and 1 coat IBD Polar Sky. Pinky- 4 coats IBD Polar Sky. See Swatch Gallery for all colors. 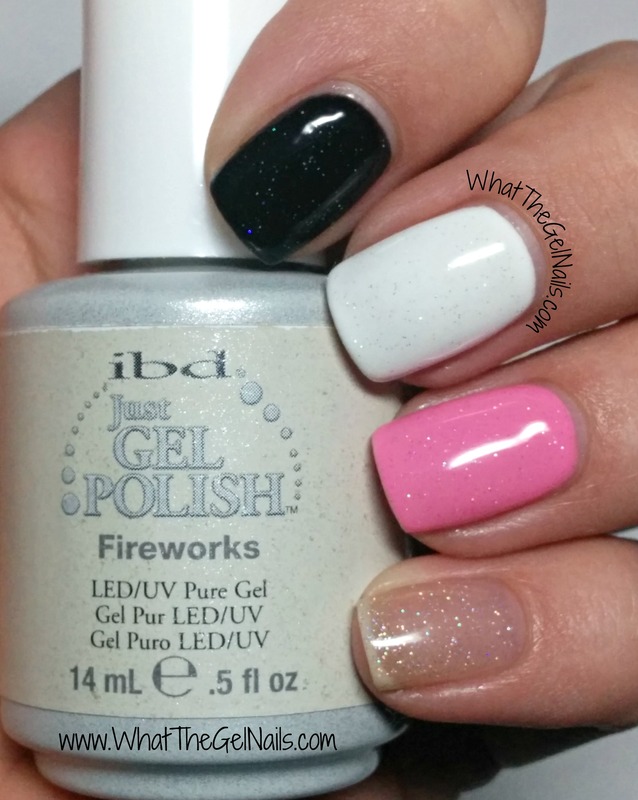 Fireworks is a simple holographic glitter topper. This one definitely does not work by itself, but it is beautiful as a glitter topper. It is perfect for a subtle glitter effect. This was my first glitter polish and it is great! The first picture has different coats on each finger. You can see that multiple coats do make a difference, but not a huge difference. The second picture has IBD Fireworks over different colors. Pointer- 3 coats IBD Black Lava and 1 coat IBD Fireworks. Middle- 3 coats IBD Whipped Cream and 1 coat Fireworks. Ring- 3 coats IBD Funny Bone and 1 coat IBD Fireworks. Pinky- 4 coats IBD Fireworks. 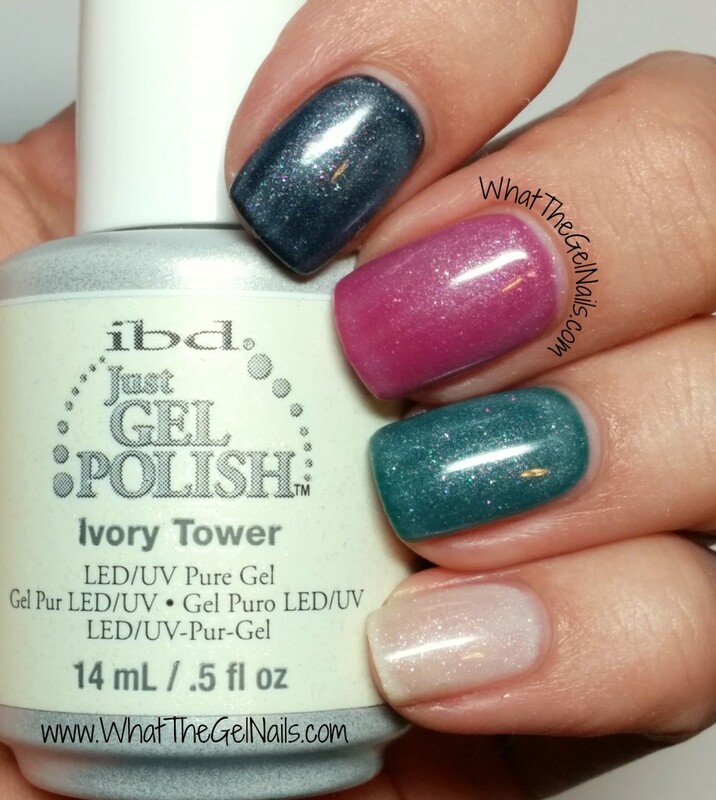 See my Swatch Gallery for full size photos of these gel nail colors. Lots of times, glitter polish can be a pain to work with and glitter gel polish is no different. 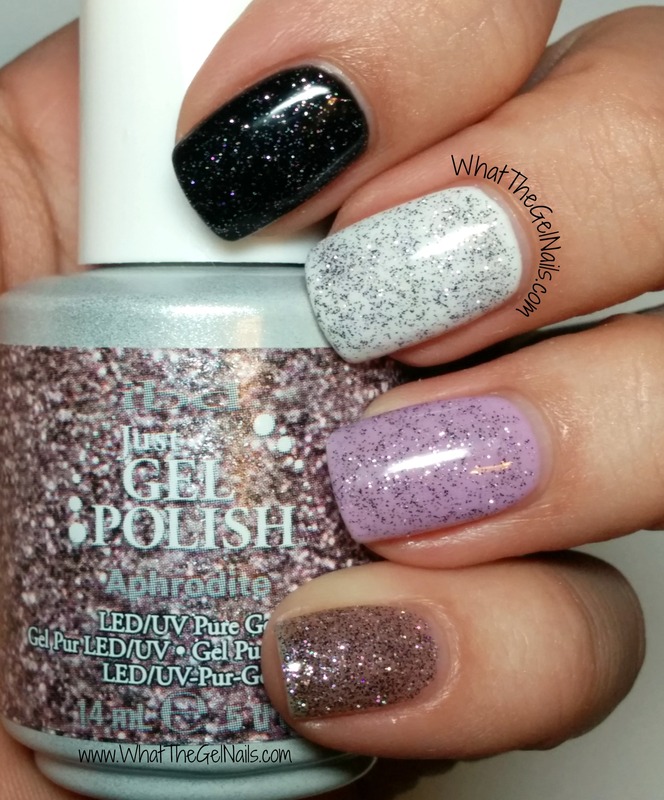 The glitter definitely sinks to the bottom of the bottle and it can be difficult to get the same amount of glitter on each nail. I use a few tricks to make sure each nail looks the same. Use a Robart paint shaker to evenly distribute glitter throughout the bottle. I have a Robart shaker and it is awesome! It shakes my glitter polish up nice and evenly and makes it much easier keep glitter looking consistent between nails. Close bottle and shake a few times in between each nail. I sometimes have to do this even after using the Robart paint shaker. It really helps keep the glitter consistent. If I am doing only one coat of glitter on top of each nail, or I am just doing a glitter accent nail, it’s really not that annoying having to shake in between coats. If I am doing full coverage glitter on every nail, this step can get tedious pretty fast. When you first pull out the brush, wipe the brush against the sides of the bottle a few times then put it back in the bottle and do it again. I find that when I very first open the bottle, the brush has a ton of glitter on it and I can never get that much glitter on it unless I put it in the Robart for about 10 seconds. If I try to wipe off some of the glitter and then put it back in the polish and wipe again, there is still a lot of glitter, but not an amount I can’t replicate.